Our range of products include designer printed kurtis, indo western kurtis and western kurtis. Being a client-centric organization, we are engaged in offering a wide range of Designer Printed Kurtis. At our sophisticated designing unit, the offered kurtis are designed in accordance with the prevailing trends of the industry. To meet the demands of customers, we are providing these kurtis in different sizes and patterns at market leading prices. We Deals in Indo Western Kurtis. These are made of high quality material and in different designs and colors. Focusing on the quality of the offered Western Kurtis, we have gained prominence as an eminent manufacturer, supplier and exporter. 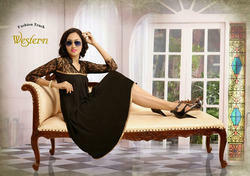 Provides aesthetic look to the wearer, we are providing the offered kurtis at industry leading prices. Looking for Western Kurtis ?